Oh wow I just love the furniture! I was pondering the possibility of tie-dying my two couches (that don't match...) and it gave me great hope to see yours! Now if I can just have the patience to try it myself. After I did my couches, I went looking for others on the internet. I was surprised to find only a couple, and they were quite different from what I had done. 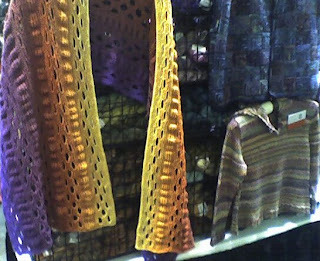 I liked these ones by Wahmpee, and this one from Dye-abolical Designs. These are very different styles, so you can get a better idea of what you might like. Really, patience isn't the main requirement, so much as the promise to yourself to really go for it and to like whatever you end up with! It's a bit of an investment, since those slipcovers range in price from $60 and up. That's not counting dyes, which can add up, especially for the really dark colors like navy that require extra dye powder per amount of water. But as long as you like what you end up with, or are willing to cheerfully throw away your investment if you really don't like it, it's well worth the effort. For my house, it makes a huge and positive change! 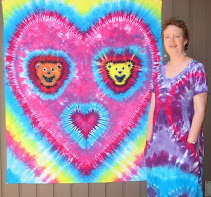 One tip: do some tie-dye on cheap cotton t-shirts first, with the pattern, dyes and colors you plan to use for the slipcovers. You can drape them over your furniture like swatches. 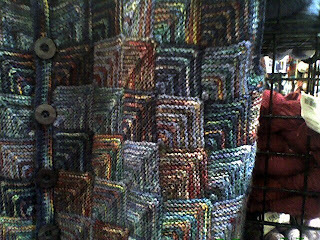 You may find that you want to change the colors or pattern before doing the real thing. And hey, you can wear the shirts, or you can give them away if you hate them! It also helps a lot to have a friend or two join you. It makes the folding and dyeing go much faster (and it's more fun, of course! ), and they can help muscle the stuff around as well--it's really heavy when wet, and the slipcovers are quite large and awkward to fold. Patience actually is helpful for a couple things: 1) letting it sit wet in the dye overnight, and 2) for ironing the slipcovers when they are washed out and finished! It's a lot to iron, but they just don't look very good until they are ironed. It's cotton, after all, and ironing makes a big difference. If you are serious about getting the look, but don't want to do it yourself, Wahmpee does custom work, or I can. But where's the fun in having someone else do it if you can do it yourself? 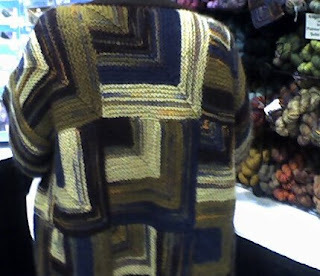 Hm, I wonder how my couches would look in brown swirls to match my dog's brown t-shirt? Another project!